In an effort to shoot a "what's up?" to one of my friends who's away for the summer working in the baseball world, today the blog features the team that serves as his employer. The State College Spikes, who have been an affiliate of the Pittsburgh Pirates since the beginning of the '07 season, have had 28 seasons of history as a franchise. The team has has multiple cities to call home in the past, those of which are: Newark, Hamilton, Glens Falls, and most previously Augusta, New Jersey as part of the Cardinals organization. The Spikes, who play in the Pinckney Division of the New York-Penn League of Minor League Baseball, host their home games at Medlar Field at Lubrano Park. MFaLP for short, is a 6,006 fan capacity ballpark (including standing room) in University Park, Pennsylvania which also hosts all Penn State Nittany Lion baseball games. The Spikes are managed by former minor-leaguer Dave Turgeon, who most recently served as an assistant coach on the Virginia Tech Hokies staff. Some notable Spikes that have ascended the ranks all the way to "The Show" are Brendan Ryan and Jason Motte, who are both alumni from the Cardinal affiliate days, and most recently Daniel Moskos and Tony Watson who both made their Major League debuts this season for the Swinging Buccos of Pittsburgh; Additionally, Zach Duke made a brief appearance on a rehab assignment while with the Pirates in 2007. The cap, shown above, is the official road cap of the club which I found at Lids HERE. 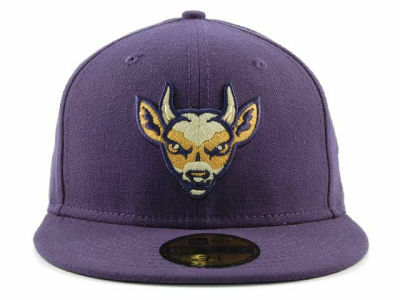 It features a navy crown and brim, with a male deer or buck front and center staring with eyes of determination. Also, the alternate and home fitted caps, along with other on-field wear can be found at the Spikes official team store HERE. The Spikes are a team of little history in Pennsylvania, but great potential of success. Due to the continually prized draft picks the Pirates seem to be continually racking up, the club is bound for glory in the near future. Looka like a Milwaukee Bucks cap.